Wow, that was a cool swap we did last week for the anniversary. I mailed ATCs to places I have never sent mail before. Very fun. I didn’t visit as many desks as normal and am not sure if it was due to the swap or my crazy schedule. This week I am actually away from my desk at a Copic Certification class. I am very excited and will share the details next week. So today’s photo is not my desk. In fact it is my carpeted floor in my craft room. 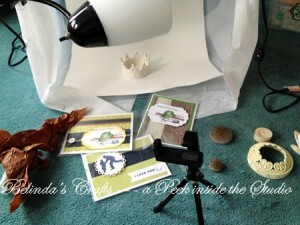 This is where I take photos of the paper products I make for my Etsy store. Let me say first off that this is not a shameless plug to encourage more sales. I just thought it would be a nice switch up from my desk. The cards you see are my latest products. They are Father’s day cards. For some time now, I have wanted to open a store on Etsy to sell some of my paper creations. I finally got the courage a few monthes ago and just did it. Fighting a lot of insecurities along the way I might add. You really put yourself out there when you sell online. But I like the ability to work from home, making things I love. One day, I hope for it to pay for my crafting. Because as you all all know, papercrafting isn’t cheap. All the embellishments, tools, papers just lure you in and before you know it the cashier is saying, “That will be $65.” And you have to catch your jaw from dropping. Oh and an update on my washer drama. Yeah, my new one arrived and I have to say I am on the honeymoon phase with it right now. I am so happy to load it up and push the button and smell fresh clean laundry. After a short time without my dryer (long enough for me), I am feeling so appreciative of it. Let me also say I know from experience this is short lived and I will be back to my usual self – complaining about the piles and the overflowing bins again. It’s coming. But for now, I will just enjoy the ride. I hope you all are well and thank you for visiting my blog. I will be away from my computer until late Friday so have no fear, I will reply to your messages. Well I better get going so that I can start spanning the globe looking at other desks. If you haven’t learned about this amazing creative journey you can take every Wednesday, then head on over to Julia’s Stamping Ground and you will find desks from all around the world for What’s on Your Workdesk Wednesday. Hi Belinda, Love your cards. I have not sold anything online before, but I do sale a lot of my cards by word of mouth.What size are the cards that you sale? Stay in touch. Ah yes, that moment when you head to the till should come with a health warning! Running an Etsy shop is something that I have been recommended to do for selling my cards but I just havn’t found the time to look into it. I sell a lot of mine by word of mouth too and love seeing the faces of people when they go through the stock. oooohhhh ing and aaaaahhhh ing…. commenting on things they like etc, with a shop you don’t get that experience, pity really. I wish you the best of luck, I had a good look and your cards are really good. Thanks for dropping bye my blog today and leaving a message. Have a happy creative week. Like you, I just opened an Etsy shop too. I’ve sold one of my mixed media canvases and five sets of my painted clothes pins. I have other things to list but haven’t gotten around to taking photos and writing the listing. They say you should add new things to your shop on a steady basis. Working full time I find that difficult. Also like you, one day I hope to actually make money on the items I sell — supporting my crafting habit AND supplementing my income. Wouldn’t that be something. I’ve never used Copics but certainly see them on a lot of desks! I might break down and start buying some…..
Glad I’m not the only one who makes use of the floor for crafting purposes 😉 Happy WOYWW! I am so interested to hear about your Copics class. I used them 20 years ago when I was studying Graphic Design. Hated the things cos we used layout paper and they bled like mad if you let them and they went out the lines with glee! I find I rather went off them so have not re-invested in them since I gave mine to a friends son who went to study Graphics. I rather enjoy the new Distress Markers and am slowly building a collection of those instead as they are water based. Well lovely Belinda, I’m glad you’re in a honeymoon phase with laundry..long may it last.! Today is Friday and so I guess you’ll be making your way home – bet you’re overflowing with ideas and seeing everything in non streaky colour! Hope you enjoyed your Copic Class, and that you’ve been erm, certified!